Burger King is giving away (almost) free Whoppers on Tuesday, but instead of pulling up in one of its royal drive-thrus, you’ll have to go to a McDonald’s to get it first. No, this isn’t a hunger-induced mirage. Here’s the deal: The fast food chain is celebrating its newly revamped mobile app by serving up Whoppers for just one cent each as part of what’s dubbed the “Whopper Detour.” The catch is that you have to use the app to order your one-cent Whopper while in the immediate vicinity of a McDonald’s restaurant. Clever, huh? The way it works is simple, even if you’re not well-versed in cheeseburger tech. Burger King geofenced McDonald’s locations all across the country, so when you open the Burger King app close enough to one of Mickey D’s decidedly Whopper-free eateries during the promotion, the app will unlock the one-cent Whopper deal. After you place your order, you’ll be “detoured” away from McDonald’s to the nearest Burger King to pick up your penny prize. Unfortunately for Whopper fanatics, you can only cash in on this deal once, so make it count. The Whopper Detour lasts until December 12. Burger King released a video teasing the upcoming promotion, and let’s just hope you don’t make the same mistake these Whopper-craving customers did. In the clip, several people actually showed up at McDonald’s drive-thru windows searching for the Burger King sandwich. The result? Several confused McDonald’s employees, hungry guests, and a few retrospective laughs for the rest of us. McDonald’s has yet to weigh in on the Whopper Detour on Twitter, though it’s probably safe to expect the chains to exchange some flame-grilled burns. 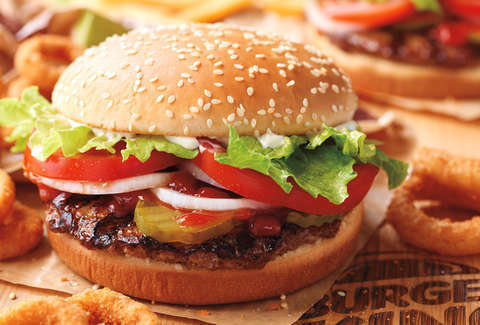 Burger King’s Whopper Detour will be available on the app beginning on Tuesday. Just be sure to download it ahead of time and make your way to your local Burger King -- er, McDonald’s -- to take advantage of the nearly free meal before it’s gone. Want even more free food? Check out our HUGE running list of all of the free food you can get your hands on all month long.